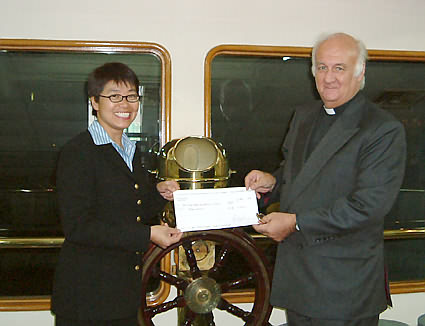 Following the success of the seminar last year, Hong Kong’s branch of the Nautical Institute have pleasure in charitable donations recently to the Mission to Seafarers and the Maritime Professional Promotion Federation. These photographs show our President of the branch, Capt. Alan Loynd, handing over a cheque for HK$15,000 to Mr. Marso Law on behalf of the Maritime Professional Promotion Federation ; and the branch Treasurer, Petty Leung, handing over a cheque for a similar sum to the Rev. Peter Ellis on behalf of the Mission to Seafarers. The branch would like to take this opportunity again to thank all those you sponsored and attended the seminar whose support enabled the Nautical Institute again to make these charitable donations to such worthy causes set up to promote and care for the interests of the nautical profession.